Writing is the subject that AJ hates the most. We have tried numerous writing programs that seem like they would be a perfect fit, but once we start them AJ dislikes them for one reason or another. We have seen a lot of improvements in her writing recently, but our lessons were taking over our day. On days we had too much going on in other subjects, writing got pushed to the side. I knew we were both ready to try something new. 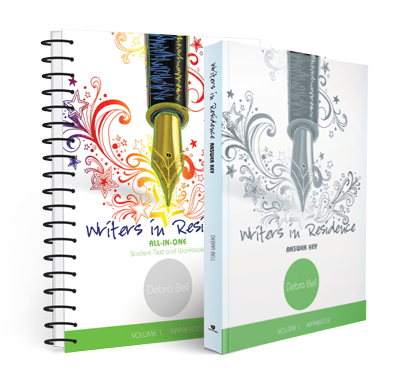 When I heard that Apologia Educational Ministries had a new language arts based writing program, Writers in Residence, I was intrigued. When I heard that it was authored by Debra Bell, I thought it would be a hit. Writers in Residence is a new product that combines a writing curriculum with grammar, sentence structure, capitalization, and punctuation practice. Writers in Residence is perfect for kids in grades four through eight. The student book is huge! At over 550 pages there is plenty of room for instruction. There are six units that each take about four or five weeks to complete. There is a schedule included that has your student working for four days a week, but that can easily be adjusted to fit your own needs. This curriculum is very flexible! After opening the box we found a small teacher guide and a 2 inch thick Student Text and Workbook. I read through the beginning of the student book and decided we would try to stick to the four day week. The lessons all looked short and to the point. AJ enjoyed the lessons the first week, and by the second week she was reminding me that we needed to work on writing. AJ worked on Writers in Residence almost every day. One thing that she really enjoyed was the variety. Some days she would write sentences about a favorite memory and other days she would pick out the verbs in the sentence and then practice walking a bunch of ways to help her learn that the more precise her verbs are in her writing the better. I think the variety in the assignments kept AJ guessing what would come next. It also meant that when she saw the writing book, she didn’t automatically assume that the work would be boring and tedious. Throughout this review AJ has completed a lot of writing and grammar exercises. One thing that is stressed throughout the program is that writing needs to be practiced. AJ was expected to make mistakes in her writing and to fix them. Each unit is broken up into a number of modules. At the end of each module you and your child go through and grade all of the work they did based on their effort and the quality of their work. Even little things like acting out vocabulary words are included. Knowing that she was getting credit for all of those fun tasks as well as the harder ones really seemed to help motivate AJ. We both liked that the book was spiral bound. That made it easy to write on at all times. We liked that so many subjects were covered at once. It made our day go a little faster. AJ liked that there was plenty of room for her to write in the workbook. She writes way too big for most workbooks, so that was a big deal to her. We both like that the instructions were written at a level that she could easily understand. That made assigning writing work easy for me. We both liked the bright and colorful text throughout the book. It was enough to be fun, but not too much that it overwhelmed her. The only thing AJ didn’t like was that it was so big. I think if this could possibly be broken up into two books it may be easier for a child to handle. If you are looking for a solid writing curriculum that incorporates other aspects of language arts into it then this is what you are looking for. It is well written, provides plenty of practice, and promotes independent learning. We will be using this for the rest of this year and all of next year. I have already seen a big improvement in her writing and look forward to how her writing will change in the future.